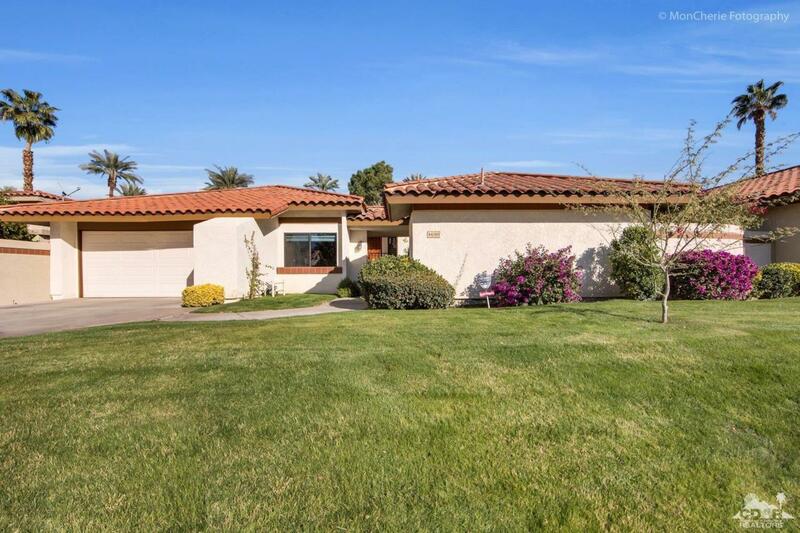 Possibly one of the most highly upgraded homes in Los Lagos. See attached list of upgrades. Roof replaced in last 2 years with solar padding added under tiles. AC condensers replaced in past ten years. 2 new Air Handlers in attic less than five yrs old, Custom Fireplace mantel with Fire & Ice instead of gas logs, tile throughout the kitchen, living room, dining room, hallways and baths. Recessed lighting in kitchen and living room, fans, extra closet with built-ins added in Master, counters in Master Bath raised with dual sinks. Gourmet Kitchen has designer Cherrywood Cabinets and many cupboards have pull out drawers. Bay windows added in kitchen and dining room. Tile has been replaced on wrap around patio with treated artificial grass and curbing. Enjoy your private stand alone spa on the patio after your $35 to $50 round of golf at the Indian Wells Golf Resort with Indian Wells Residents card as well as 20% discounts at many Indian Wells restaurants. Listing provided courtesy of Anne Alexander of Bennion Deville Homes.